Shopping Spree II Progressive Jackpot Slot Review - Casino Answers! Shopping Spree II is a 5-reel, 9-line progressive jackpot slot developed by Realtime Gaming, featuring stacked wild symbols, scatter wins, a free spins feature, a bonus game and a progressive jackpot. You can play the Shopping Spree II Real-Series Video Slot at Bovada. As the Shopping Spree II slot game is a progressive jackpot slot machine, its bets are fixed at $2.25 per spin. This is a reasonable price for a progressive jackpot slot, considering the high value of hitting the big progressive jackpot. You must always play all 9 paylines on the Shopping Spree II slot machine. You can increase the speed of each spin by going into “Options” and selecting “Turbo Play.” You can also manually skill stop the reels by hitting the “Stop” button in mid-spin. To spin the reels on the Shopping Spree II video slot, all you have to do is hit the “Spin” button. As alluded to earlier in this video slot review, Shopping Spree II features a highly sought after progressive jackpot. It is highly sought after because at the present time, this progressive jackpot is at a staggering $119,551.29 and is prime for the taking! To win the Shopping Spree II Progressive Jackpot, you must land 4 Diamond Ring symbols on a payline plus a x20 Sale wild substitute symbol. Progressive Jackpot wins are added to other slot game wins. You can play for the Shopping Spree II Progressive Jackpot when you sign up and play today at Bovada! 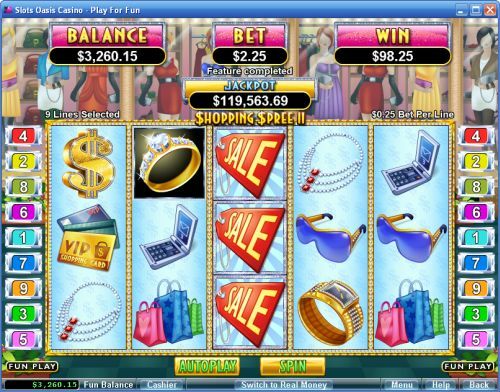 The Sale symbol is wild on the Shopping Spree II video slot. It only appears on reel 3 and will substitute for all symbols in Shopping Spree II except for the Scattered Logo symbol. When substituting in a winning combination, the Sale wild symbol will act as a 2X, 3X, 5X, 10X or 20X wild multiplier symbol, except if you win the progressive jackpot. The highest paying symbol on the Shopping Spree II video slot is the Diamond Ring symbol. If you land 5 of these symbols on a payline, you will win 5000 coins. This win can also be multiplied by the Sale wild multiplier symbol – up to 10X. Of course, if you hit a 20X wild multiplier on the top payout, you will win the progressive jackpot. Other high paying symbols include the Shopper (2500 coins) and Dollar Sign symbols (1000 coins) – although any symbol can become a high paying symbol when affected by a 20X wild multiplier! 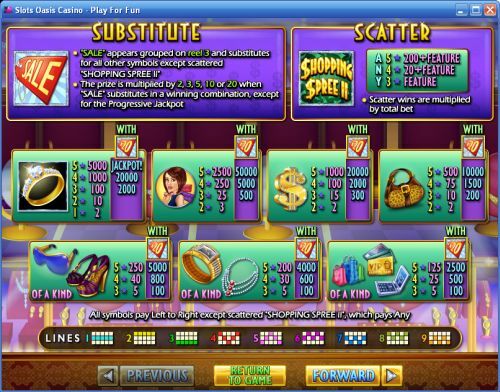 The scatter symbol on the Shopping Spree II online slot game is the Scattered Logo symbol. By hitting 4 or 5 of these scatter symbols, you can win 20X or 200X your total bet. If 3 or more appear on the reels, you will win 9 free spins. During the free spins feature, Shopping Spree free games 100, 200, 300, 400, and 500 point symbols may appear on reels 1-5 respectively. Any point symbol that appears during the free spins feature is added to the Bonus Tally (which starts at 0). Scatter symbols do not appear during the free spins feature. The Shopping Spree II bonus game will begin once the free spins feature ends. 3 bonus free spins are awarded for every 1000 points you acquire (up to a maximum to 12 free spins). Reel 3 will be made up entirely of Sale wild symbols during the bonus game. A consolation prize is awarded if the Bonus Tally is under 1000 points. Scatter and point bonus symbols do not appear during bonus game free spins. Shopping Spree II has an advanced autoplay mode. Hit the “Autoplay” button to open the autoplay settings. You will be able to set the number of spins, set it to stop when the jackpot is won, stop if a win exceeds or equals (any amount you input), stop on any win, stop if your balance increases/decreases by any amount you input and stop once the feature is triggered. You can stop Shopping Spree II’s autoplay mode using the “Stop Auto” button to deactivate it. Shopping Spree II is an inexpensive progressive jackpot slot with a lot of great features and a very fitting theme. You can play it (and its predecessor) when you sign up and make a real money deposit at an RTG online casino such as Bovada! Can players from the United States play for the Shopping Spree 2 progressive jackpot? Yes, Americans are welcome to play for the Shopping Spree 2 progressive jackpot when they sign up at any RTG online casino. If you want our recommendation, we’d go with Bovada. How come I can’t change my bet on the Shopping Spree Two video slot? Bets and line selections are fixed on this progressive jackpot slot. If you want a slot that you can customize more, try playing a non-progressive jackpot slot. Can I play the Shopping Spree 2 online slot game for free? Yes, RTG online casinos allow practice play players to play their progressive jackpot slot games for free. You can only win the progressive jackpot when playing for real money, however. Where can I read a review the previous edition of Shopping Spree? For more on the original Shopping Spree video slot, please read our Shopping Spree Progressive Jackpot Slot Review.